VORDINGBORG, Denmark — In a move to bring its audio capabilities to the cutting edge, regional broadcaster TV2 East of Denmark recently purchased a 32-fader HARMAN Studer Vista 5 M2 digital mixing console for its studio in Vordingborg. The console was supplied by Studer’s Danish distributor Danmon. TV2 East is primarily using the Studer Vista 5 M2 console for news (TV2 East broadcasts four news shows each day) and sports programming, along with regional talk shows and documentaries. The reasons for Studer being the best fit, Larsen continues, are multiple. 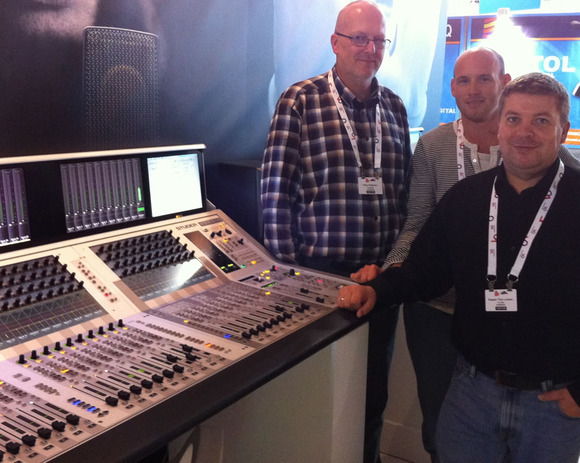 “We wanted a true broadcast-quality audio board and we get that from Studer for sure,” he said. “This Vista 5 console has the best audio quality I’ve heard from a broadcast console, and its redundancy was another major factor in our decision. It’s very flexible and it can be easily configured to our needs. In addition, the ability to control and automate the console via the EMBER protocol played a big factor in the decision process. For some applications, the console will be controlled from TV2 East’s Ross Overdrive automation system. The console will also work as an audio router and format converter in TV2 East’s infrastructure, giving them a simple and economic solution. “The integration of Studer VISTA FX by Lexicon is also a perfect match for our requirements and gives easy control of the sophisticated effects in a very cost-effective way,” Larsen noted. Larsen and his team also cited the Vista 5 M2’s TFT metering system as an attractive feature. This meter bridge is capable of displaying signal levels from mono through to 5.1 channels on each input, with a configurable lower area which can be used to display bus assignments, sound images or the unique History mode, where a scrolling audio waveform displays signal anomalies and highlights them for up to 50 seconds to allow the engineer to identify where the event occurred.